Lawyers representing Amazonian villagers in Ecuador used bribes to secure compensation worth billions of dollars from Chevron, a US judge has ruled today. The latest ruling means that the Amazonian villagers cannot use US courts to enforce the ruling against Chevron. 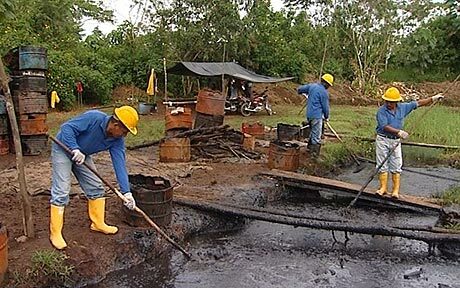 Chevron had been found guilty in Ecuador of causing environmental damage to the Lago Agrio region. The legal team says they will appeal. In 2011, an Ecuadorean judge ordered Chevron to pay $18.2 billion for “extensively polluting” the Lago Agrio region. Ecuador’s highest court last year upheld the verdict against Chevron, but reduced the amount of compensation to $9.5 billion. The alleged environmental damage was done by Texaco between 1964 and 1990. Texaco was later acquired by Chevron. Chevron has always maintained that it cleaned up the area before handing over the oil field to the Ecuadorean government. The oil company argued that it only lost the case because the legal team representing the villagers paid nearly $300,000 in bribes in Ecuador. US district judge Lewis Kaplan in New York has now ruled that Steven Donziger’s legal team used “corrupt means” to win the 2011 case. Lewis Kaplan described the evidence against Steven Donziger’s team as “voluminous”. Chevron’s chief executive, John Watson, hailed the ruling as “a resounding victory for Chevron and its shareholders”. The legal team representing the Ecuadorean villagers has also sued Chevron in Brazil, Argentina and Canada. But Chevron believes the US judge decision will help them fight their case in other courts. The plaintiffs say that the oil company knowingly dumped 18 billion gallons of toxic waste water and spilled 17 million gallons of crude oil into the rainforest during its operations in north-east Ecuador. They say the affected area covers 1,700 sq miles on the border with Colombia.